Have you ever joined a game of Minecraft and then just took off in a single direction? It happens. After all, each game is vast and has so many terrains and settings, and so much potential! In fact, it’s easy to get excited and spend hours working on a single build. Soon you start feeling proud of your accomplishment and before you know it, you’re itching to share it with the world! This is the part where many players go off and start their own servers, hoping to get more players to join. The problem, though, is that all your friends are already too busy working on their own servers to pop in. What’s a Minecrafter to do?! BungeeCord is an awesome tool that allows server owners to safely create reliable connections to one another. 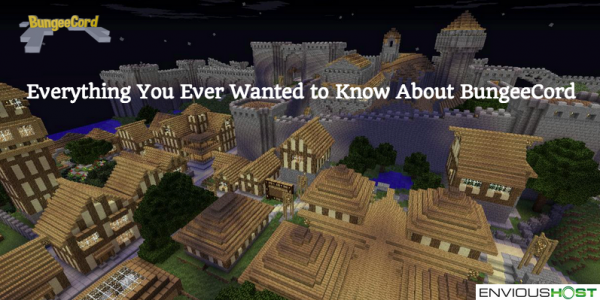 This enables server owners to create vast, huge networks made up of several Minecraft servers. We told you it was awesome! With BungeeCord, not only can you support multiple servers, but you can also enable API and Java plugins to help you experience Minecraft in ways you never have before. Think of it as a literal bungee cord that allows you to dive off into various worlds while keeping you tethered to a primary server. You can go and visit, but you’ll always have a home to come back to! So what does this really mean for you? Tech-speak aside, BungeeCord simply allows you to build your own incredible world on your server, but still connect that world to all your friends’ other vast worlds. It allows for the creativity and programming that goes with setting up your own multiverse. Some people may use this ability to build portals to various worlds. This is great fun! Just think of it like making your very own MMO where people can come and go – visiting cities, exploring dungeons and hanging out at local businesses. Ok, so maybe that last bit is an exaggeration, but the creative potential that BungeeCord allows for is unlimited. So how does BungeeCord work? As a player, you join a BungeeCord server, which is actually acting as a proxy server. This proxy server will allow you to join different servers without reconnecting. You do this by using the Janus Portal or built-in BungeeCord commands. The primary proxy server will be connected to a single assigned server called the “hub”. Think of this as home base. Each additional server that attaches to the “hub” (home base) is considered its own world. So you can think of BungeeCord as enabling you to set up a home base (the hub) and then opening up portals to a network of other universes (the other servers connected to the hub). Pretty simple, right? Once BungeeCord is connected, the entire network will spread out population loads across the connected servers. This means more processing power! It also allows the owner to divide up activities, such as which game modes will be found in which areas. How cool is that?! BungeeCord also allows users to integrate plugins (based on user specifications) using an extensive API. Really the only limitations to the system are how YOU choose to use it! 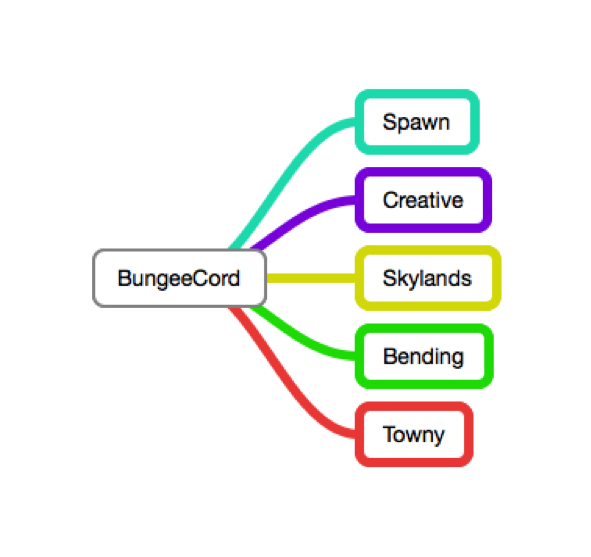 Once you’ve made up your mind that it’s time to create your own multi-faceted world or MMO, BungeeCord is the perfect answer. Below, we’ll show you how to install BungeeCord instances on your own server, but keep in mind that this is for people who are comfortable making such updates to their own servers. If you aren’t ready to take this on yourself, let us know! Our team is happy to help provide install support for a small fee, but you will still be responsible for your own configuration. With that in mind, let’s get started! Step 1: Install Java 7 or higher. Step 2: Download a copy of BungeeCord. Step 3: Create a new folder for BungeeCord and place the downloaded file inside of it. Step 5: Run the startup script you just created. It’s that simple! This is a fairly simplified “how to” guide for installing BungeeCord. If you have further questions, there are resources available online to help you resolve any issues you may run into. If this is ever the case, we recommend starting at the source. The official BungeeCord Wiki is the perfect place for this. Now that you’ve got BungeeCord installed, it’s time to set everything up the way you like. The first step will be incorporating security and setting up your world servers. Start by setting each connected server (aka, all servers that are not the “hub”) to offline mode and set the connection throttle in your .yml file to -1. The create links for each of these servers in your config.yml file. You’ll be ready to rock in no time! 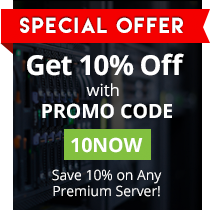 Your BungeeCord server will work best if you allocate at least 1GB of RAM per every 1000 players. Remember too that adding plugins will tax your system, and can cause you to need more RAM. If you ever experience lag, let our team know and we can get additional RAM added to your plan straight away. At EnviousHost, we’re here to help! We know that setting up BungeeCord can be a daunting task, but this guide was created to make it possible for anyone. And once you do get your new BungeeCord server up and active, it’s totally worth it! Just imagine milling about in various worlds – the cities, the mini games, the people you’ll meet…who can resist? !